Okay, all you cowpokes out there in blogland, we have finished our Wild West Cowboy Fun packet!! This one is especially for Mrs. Robinson and her fabulous firsties. She has a rip-roaring good time with her Cowboy theme and needed some glyphs to kick-off the year. Maybe she'll let us post some pics when she completes them in August. Her room is CuTe! Click on any of the pics to go to our TpT store and take a closer look! 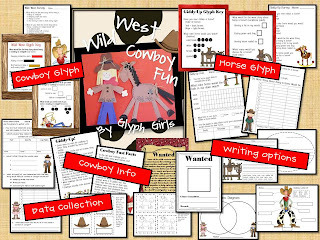 This one has TWO glyphs included (a cowboy/cowgirl and a horse), plus a ton of writing and data collection resources. We've had requests for photos of our classrooms. Angela is moving to a different room and my room has everything piled up in the middle of the floor (they just finished waxing). We'll soon get the itch to start working on them and we'll be sure to take Before and After shots to share with you. What would we do if we didn't have summertime to recharge, regroup, and redecorate for the new year? Soooo thankful for all the fabulous teachers out there who share their ideas on blogs and Pinterest!! Next up -- PIRATES!!!! ArrrGh! P.S. The first person to comment wins this packet for FREE!! Paper Bag Princess Fairy Tale Fun!! Our Paper Bag Princess project has been added to our Teachers Pay Teachers store! Take a peek --we think you'll like it. The kids adore this story by Robert Munsch. Click on the picture above to link to our TpT site. It includes a dragon glyph, patterns to make Elizabeth and Ronald, retelling puppets, tons of writing ideas, and more!